What’s Included: 7 nights, daily breakfast and dinner, group transfer from/to Amsterdam Schiphol Airport; English-speaking guide, bicycle rental, all entrance fees, support vehicle, and our famous t-shirt. It begins with complete immersion in things Dutch. After departing the United States and arrival at Amsterdam Schiphol Airport on the following day a visit to the Zaanse Schans brings you up to speed on windmills, wooden shoes, and pancakes of imaginative flair before boarding the barge at the dock in Amsterdam. 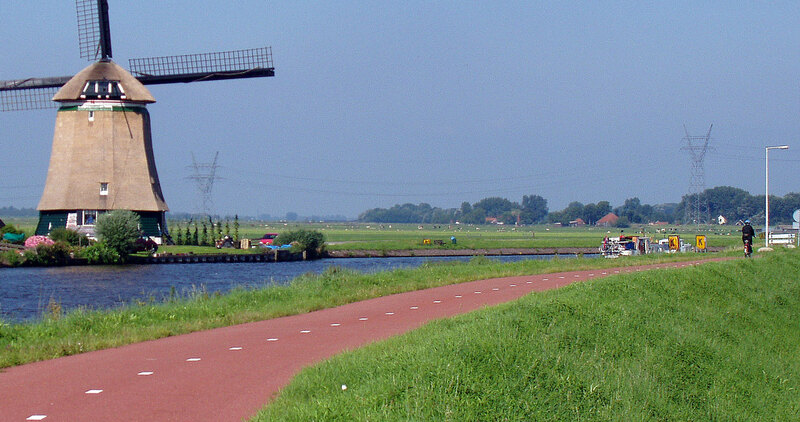 We will traverse the Golden Circle mostly by bicycle but partly by ship, heading north from Amsterdam to Hoorn, to Enkhuizen, to Stavoren and around the huge lake called IJsselmeer to a series of other towns hard to pronounce if you weren’t born Dutch. IJsselmeer, before a dike made it into a lake, was the Zuiderzee and the launching point for vessels that brought wealth to Holland and made its merchants rich men. The tangible benefits of that wealth still mark the country. A segment of the Golden Circle is Friesland, where road signs are in Dutch and also Frisian, a local speech the rest of the country doesn’t use much more than you do. Friesland knows what’s basic: dairy farming. In its capital is a statue of a cow, and in its barns and fields bovine life could hardly get better. We move on, with a notable absence of hills, into a province that once was the bottom of the sea. 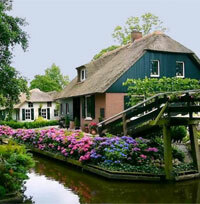 Flevoland now has towns and farms and roads; houses are often thatch-roofed for the practical reason that the reed grows locally. We are on reclaimed land, called polder, that is as much as twenty feet below sea level, a surprising thought if you’re not local. 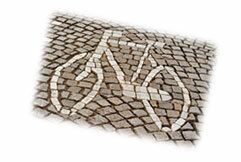 This tour is a mixture of old cities with splendid old homes, dense forest inhabited by night-roaming wild boar – we do not bicycle at night – and an enveloping sense of its own identity. It is what it is, and doesn’t worry if other places are different, but is welcoming and pleased to have you passing through. We traverse it by bike and by barge, visiting towns like the canal-threaded village of Giethoorn (Venice of the North) and Elburg, lined off by city walls at the edge and canals within. 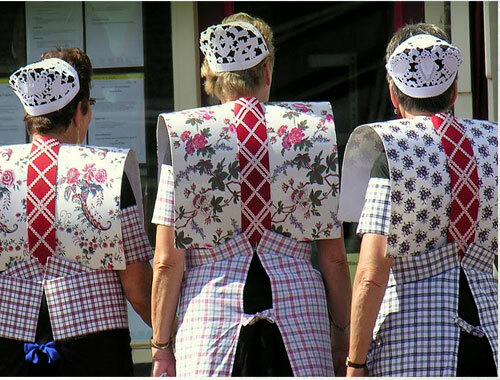 The last day on the bicycle takes us to a remembrance hall where 20th-century Nazi-driven horrors are documented, and to Spakenburg where the last wearers of the local costume still can be seen. These colorful dresses and their accompaniments are not part of younger women’s wardrobes, so should be observed while they can be. The tour winds up with a day in Amsterdam, rich in museums and shopping opportunities and free beer at the Heineken Brewery, with the farewell dinner rounding off the day and a week in parts of Holland the casual visitor may not have seen.